Air/Hydraulic Brake Actuators are designed to take advantage of available pressurized air sources to produce high hydraulic pressure. This design feature is especially important for towing self-propelled hydraulically braked vehicles when the towing vehicle is equipped with air. 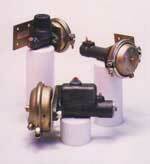 These brake actuators are ideal for industrial applications. Air chamber sizes are available from 12 to 36 square inches and hydraulic displacement available from 16.39 to 147.48 cm3 (1.0 to 9.0 in3). Remote or integral reservoir models are available for mineral base hydraulic oil or brake fluid.